I’ve had a chance to get pretty familiar with the mechanical design of the Printrbot Simple Pro. It is a straightforward and memorable design, and makes great prints. This printer is a classic Brook Drumm - tight clearances and compact spaces are a design goal. Built like a tank and hits the sweet spot between rigidity and portability. I got my hands on a Simple Pro chassis; mechanical parts only. You may have picked up one of these when Brook ran a “rolling stock” sale on the Printrbot store. I wanted to put together electronics for a printer from scratch. This post is not a guide - if you aren’t comfortable starting a “kit” project with only 80% of the materials and knowledge you need to finish, you should not consider a project like this. That said, I found it to be a great learning experience and wanted to share my work here so people knew what parts I sourced and how I approached this project. Read full post. Published on April 16, 2019 by Brian Fife. There are tons of guides that walk through how to set up a Raspberry Pi. I’ve recently configured multiple devices “from scratch” with OctoPrint and a touchscreen LCD in kiosk mode. Read full post. Published on April 15, 2019 by Brian Fife. I am in the process of assembling and tuning a new printer. This one has a 14:1 geared stepper driving the z-axis. The white cube on the right is in the right range, dimensionally (20mm^3). 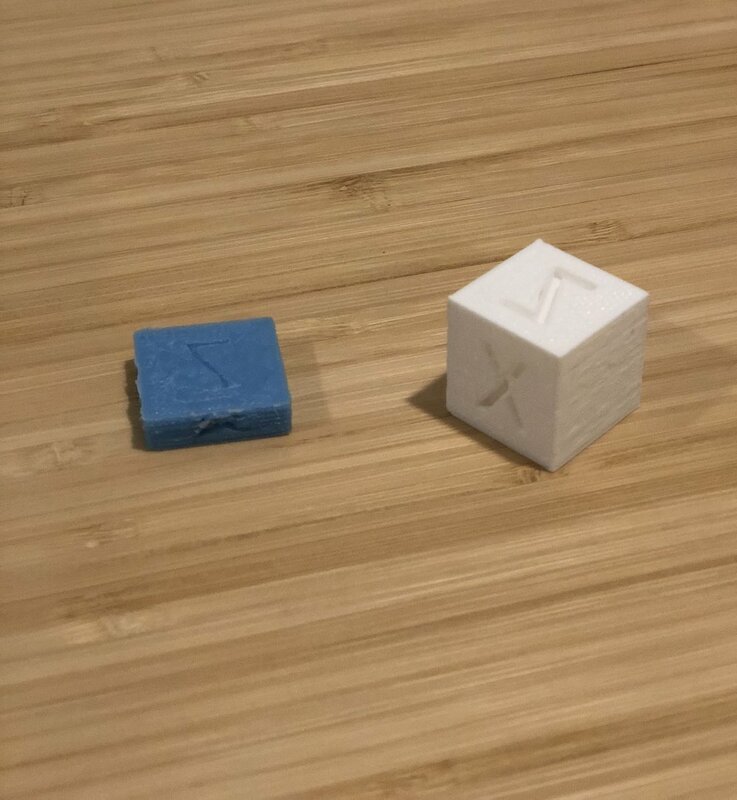 The blue one on the left is 20mmx20mmx6mm. Internet searches on this were not helpful at first. There's a lot of discussion about how to properly set your steps/mm for the z axis. This wasn't my problem though. When I jogged the print head around and measured, movements were accurate. My steps/mm were correct. Finally, I found a super-helpful post on the reprap forums. My thanks to konwiddak, jamesdanielv, and the other contributors on the thread. Tune down your z-motor current and make sure your controller board is properly ventilated. Set a low feedrate for the z-axis, 2 or 3 mm/s. Increase your z max acceleration. Link. Published on March 12, 2019 by Brian Fife.